Antique Lace Trim Art Deco Flowers Circle Dots White Edging 36" x 1 3/4"
Here is an antique lace trim with a repeating art deco flowers pattern with tiny circle dots (yardage 4 yards long x 1 3/4" wide). This is a antique lace trim with a straight edge at the top & scallop edge at the bottom of the antique lace. Antique Lace Trim Measurement: 4 yards long x 1 3/4"
Antique Lace Trim Condition: The antique lace trim is in very good unused condition. 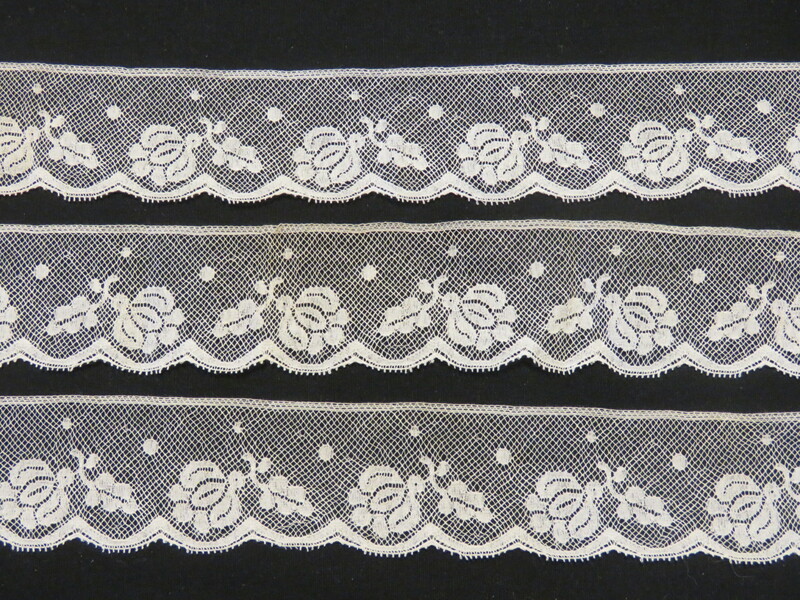 This lace trim is from the estate of a French seamstress who was a doll collector. The antique lace trim is in "as found condition" in that I have not washed it and there Is some light storage staining to the edge that was exposed to the air.